A man has been arrested on suspicion of causing grievous bodily harm after a 20-year-old had an unidentified liquid thrown in his face in Leicester. The victim was treated in hospital for "significant injuries", police said, and has not regained sight in one eye. 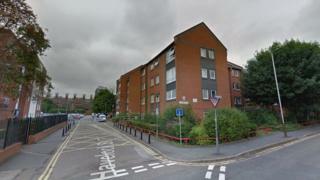 He was attacked near Jarrom Court, near Leicester Royal Infirmary, on 19 May. A 33-year-old man who was arrested has been released under investigation, and another 20-year-old man has been identified and spoken to by officers. A Leicestershire Police spokesman said the liquid is not believed to be acid but is being tested further. The force is also aiming to trace another man caught on CCTV footage. Det Con Damian Young said the victim is "recovering well" and "may regain" the sight in his eye, but appealed for witnesses to come forward and identify the man.